Can you feel all the eyes in the room rolling over? People don’t buy what they don’t understand, so it’s important to be able to describe what you do so it’s clear, succinct & memorable. And that is why you need to be able to clearly describe your unique value. Luckily, it’s easier than you may think. And that’s because you don’t need to reinvent the wheel. You don’t need to be witty, clever, whimsical or even original to get the results you want. In fact, messaging that works best is usually the short, sweet & simple kind. You need to have a clear, short & memorable response to the question, “what do you do?” Because if you can’t clearly explain it, then no one will know if it’s for them or if they should buy from you. No matter who you ask, any advice you find on how to tell people what you do will include 3 key pieces of information. They’re proven to help you craft a clear and meaningful value propositions without having to hire a clever and talented messaging coach, like me. Let the formula free you from all the ideas that you have swirling around your brain right now. It’ll help you get clear on what makes your business special. As Albert Einstein famously said, “If you can’t explain it to a six year old, you don’t understand it yourself.” This is true whether you are a life coach, designer or energy healer. Your dream clients want to understand what you do — they just need a bit of help from you. That help comes in the form of a simple, clear description. I’m a [job title] who helps / works with / serves / inspires [target market] to [result that you achieve for your clients] through / by / using [tools, methods, teachings, etc that you use to get your results]. It’s a simple, but powerful formula. And it works best when it’s written the way you speak. You know that it still needs work if you feel squirmy when you say it out loud. Just because it’s simple, doesn’t mean you can’t jazz it up. Get creative and move the puzzle pieces around until you find the clearest, most memorable version that will appeal to your dream clients. Now let’s see some examples, shall we? I’m a health coach who works with 20-something professional women to help them feel more confident in their bodies while conquering the corporate ladder by teaching them how to fit healthy eating into their busy lives. I’m a literary coach who helps passionate soon-to-be authors get unstuck and finally get their books down on paper. I teach mindset strategies to help them overcome their writing blocks and get more writing done in less time. I’m an accountability coach who works with ambitious entrepreneurs to help you break free of stress & uncertainty to unlock your goals, creativity, & intuition. I help you focus on what really matters and ignore the rest. I’m an interior designer for zen-loving homeowners who want to achieve peace and harmony at home. I make the design process stress-free by removing the pressure on creating beautiful rooms, injecting bold colour, or being trendy, and just focus on you and your desires. I design one-of-a-kind accessories and clothing so that you can express who you are in whatever you wear each day. I bring out the beauty in each person and their unique way of expressing themselves through their wardrobe. I’m an energy healer who works with entrepreneurs who struggle with their money and abundance mindset. I help clear the unconscious blocks that are stopping them from reaching their revenue goals. I’m a naturopath who specialises in pre-natal care for mothers who are battling stress and dealing with a new pregnancy. I make sure we’re starting a new life off on the right foot & improving the health of our generations to come. I’m a kinesiologist who reads the information held in your body to unleash your inner guidance so that you can grow a business that is in true alignment. I serve ambitious entrepreneurs and high achievers who want to run a fulfilling business with deep integrity. How do you know when you’ve struck gold? This formula is an excellent start, but you need to test out your creation to make sure it resonates with your audience & will get results. 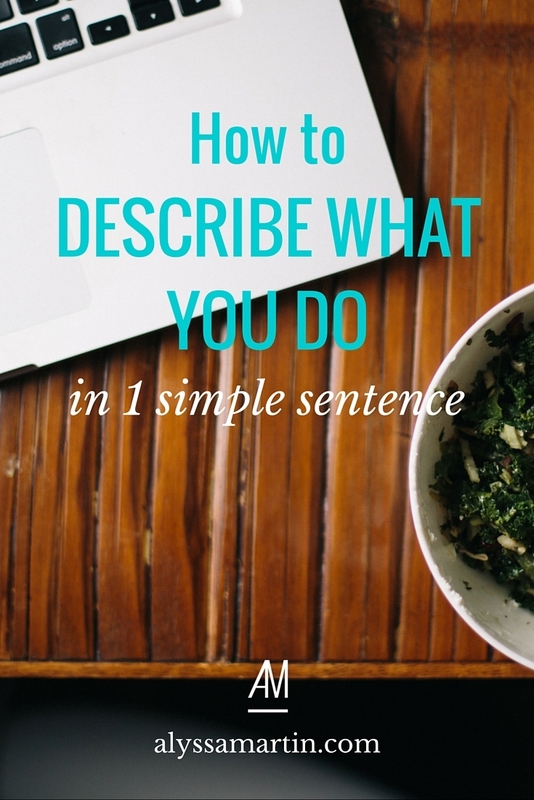 Use this simple formula to get clear on what you do. Then, start using it next time you get asked, ‘what do you do?’ See what kind of response you get. If the response is a bit ‘blah,’ re-evaluate your message, insert more of your client language and keep perfecting it. If the response is something like, “OMG my sister totally needs that,” then you know you’ve got something. Your message should make people understand what you do so well that they can visualise who needs it. Look for that kind of recognition when testing your message. Once you’ve mastered it, it’ll be so much easier for your audience to understand what makes you different, better & worth working with. All of your marketing and self promotional activities will start to resonate more with the right people & you’ll begin to see bigger and better results.